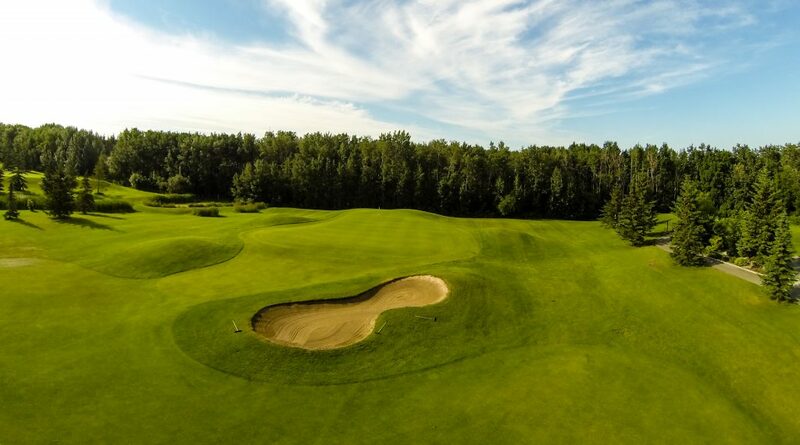 Eagle Rock Golf Course offers a Championship 18 with 6630 yards of rolling fairways and larger greens. Hole Public Facility that accommodates those looking to enjoy a round of golf. Water comes into play on 10 holes and you are sure to experience one of 45 sand traps. Eagle Rock is designed for all levels of golfers. Catering to all player levels, the public course is renowned for offering a high caliber golf experience at unbeatable value. Eagle Rock Golf Academy: Whether you’re a senior, junior, group or single, we are sure to have the golf accommodations you’re looking for. Eagle Rock offers Men’s, Ladies, and Seniors Leagues, as Lessons and junior golf programs are also available with our Head Professional and Associate Professional. 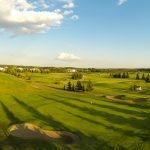 The Eagle Rock Golf Academy is home to Edmonton’s finest professional teaching staff. 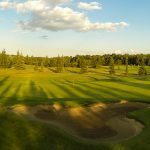 Each instructor is a member of the Canadian Professional Golfers Association and has earned the highest level of certification in the country. Eagle Rock offers private, semi-private, group and playing lessons to accommodate for busy schedules and ability. Practice Facility: Enjoy an immaculate grass driving range to fine tune your swing before you head out onto the course. Eagle Rock also has a practice and chipping green with a practice sand trap. Clubhouse & Catering: Stop in after your day on the course at the Eagle Rock clubhouse to take in the breathtaking view on the balcony overlooking the 9th and 18th greens. Eagle’s Nest Catering provides all pristine food services on our golf course. Eagle’s Nest Restaurant offers Sunday Brunch on special occasions, such as Easter, Mother’s Day, and Father’s Day. Our banquet facilities have seating arrangements for up to 200 people. Eagle Rock also has a stunning area to hold an outdoor wedding ceremony. Golf Shop: Recently updated in 2011, the Golf Shop carries apparel and merchandise from the leading brands such as Taylor Made, Titleist, Addidas, Foot-Joy, Ashworth, Lopez, Loft 8, Pukka Headwear and Antiqua/Antech. Clubs rentals are also available. Let’s face it, every golfer has their price point. While it’s nice to play at top-end clubs not everyone can afford that on an every day basis. That’s where great municipal tracks, like Edmonton’s Eagle Rock Golf Course, now being called The Rock, come into play. 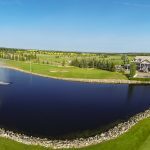 This 18-hole facility in the southeast corner of Alberta’s capital city offers a layout that’s not only fun to play but is an easy walk for all levels of golfers. At the same time, it presents enough challenge to hold one’s attention. The course’s Head Professional, Chad Rumpel noted his layout is all about people coming out and enjoying themselves – at a great price. “You come out here, pay your green fee, let your hair down, and just go out and have a good time,” he explained. “My staff is a good group of people. They’re trained very well and are very welcoming. Over the last two years we’ve recreated the image of Eagle Rock Golf Course to ‘The Rock’,” and by all appearances the playing public is enjoying that change. 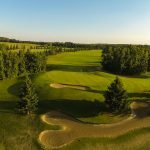 Rumpel explained a large part of the change at the course has been done around redesigning the pro shop and its lines of goods, creating a new website and bringing in new electric power carts to make one’s day here enjoyable. A large part of that has to do with course conditions, as the pro notes, “Our greens are probably some of the best in the city,” given their size, smoothness and the speed at which they allow a ball to roll. And all that comes with some of the best rates in the city. Over the past while Edmonton has become a more expensive place to whack balls around on grass so The Rock is striving to make the game accessible to as many public players as possible. “I have Early Bird specials. If you book online you get specials. 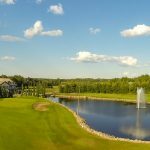 If you book through Play Golf Alberta you get specials. The value for your dollar is unreal out here,” the pro stated. The course itself is short by today’s standards at 6,600 yards from the back deck. That though doesn’t mean there aren’t challenges. From the back tees two of the par 3 holes here are a big clout and a prayer that it’s big enough. The fifth hole measures 235 yards from the back end and the 16th plays only a yard shorter. Miss the green on either hole – which isn’t that hard to do even given their size – and you’re looking at making a tricky up-and-down to card a ‘3’ at either of these holes, and if that’s what you come away with, it is well earned. The Rock also offers a large practice facility where Rumple, associate pro Peter Kenneford and others are available for lessons to help you conquer those long tee shots among other swing issues. As for defining his track, Rumple says it’s a blend of things. “How’s it play? It’s easy, welcoming and there are some tough holes out there but it’s a lot of fun,” he ended. 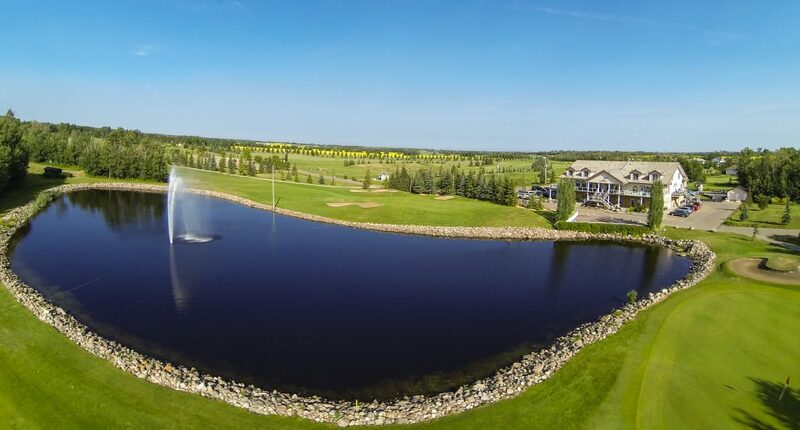 “I had a great time playing with Gord, Chad, and Peter and wow, are those par 3’s challenging!” said Play Golf Alberta’s Jeff Sveen, himself a Class A golf pro. Superintendent Darryl Kuhn has been on-site since 1989, when he helped clear the field of rocks where the course now sits. In fact, when nine holes opened in 1990, he became the first, and to date, only superintendent. 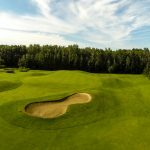 In a busy golf community like Edmonton, Kuhn noted that marketing this course is important both in keeping up the challenge but at the same time not making The Rock too hard for the game’s newcomers. At The Rock, there are 14 holes with water in play making it a challenge to keep traffic flowing but with the shores of the hazards kept clean, it helps keep people moving when looking for stray shots. “It’s either in or it’s not,” Kuhn said about a missing ball near the water. “When grass and weeds are high and tall, people keep looking,” but if sight lines are clear it moves players along. By the way, a diving company visits Eagle Rock “a couple of times a year and we’ve had up to 35,000 pulled out at a time when they only come once a year,” which means the clear-cutting strategy is working well and keeps players moving at a good pace at this course where upwards of 35,000 rounds a year are played. One thing about the Eagle Rock GC is that they don’t only cater to tournaments but a large number of weddings as well, food services manager Linda Kuhn explained. She’s the owner of Eagle Nest Catering that handles the 80-seat restaurant in the clubhouse, with meals from breakfast through supper served daily. Their banquet facility holds up to 200 people with all the bells and whistles. “We offer full service catering and decorating,” she said of any sort of celebration customers may wish to bring to the course’s banquet area. Those include on-course photography that can be arranged, along with a champagne reception outside the clubhouse. Meals for such occasions can include bar-b-ques along with buffets and plate service for weddings. “Our most popular dishes are beef or the salmon and dill,” she ended about a golf course that makes the game, as well as the after-game festivities fun for everyone. About the writer: Gord Montgomery is the sports editor of two weekly newspapers in the Edmonton area and is a member of the Golf Journalists Association of Canada. He has written for Inside Golf for the past 10 years with the majority of his coverage in north and central Alberta. He can be reached at noraltagolf@gmail.com and he’s also on Twitter at @Gordinsidegolf.